This salad is a hit to bring to barbecues and pot-lucks. You’ll find yourself making this salad a lot! At Trader Joe’s you can find bags of tri-colored small potatoes: purple, red and yellow. Or if you are strolling through a farmer’s market you’ll also spot lovely potatoes for this salad. Cut each potato in half, and then into fourths. Smaller cut potatoes means that your have more surface area exposed to absorb the delicious dressing! Put the potatoes in a generous pot of salted water and bring up to a boil. Monitor carefully, since potatoes go fast. When they are almost there, add the beans for a minute or two until bright green and still crunchy. (Skip this step if you are using previously frozen). Carefully pour into a colander and then immediately shock in cold water to halt the cooking process. (We don’t want to have mushy potatoes, now, do we?). Drain, and put in a salad bowl. 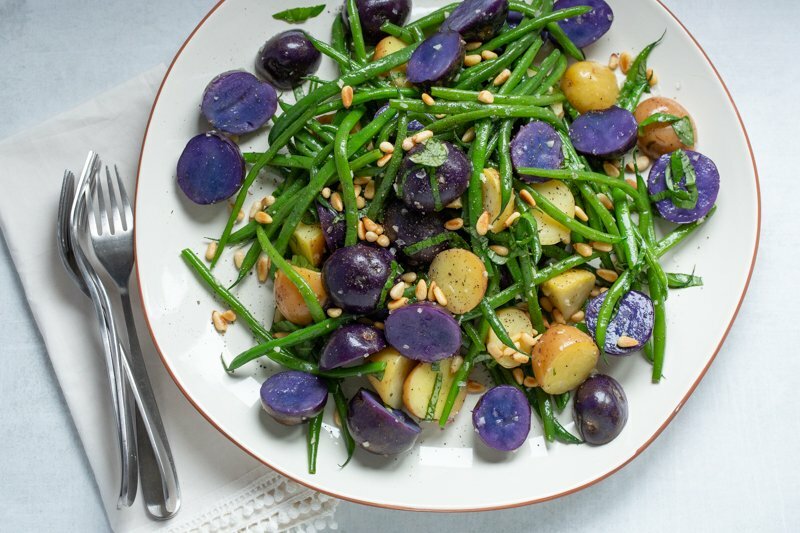 Prepare the salad by adding the garlic, basil and pine nuts to the potatoes and beans. Sprinkle sea salt along with a few turns around the bowl with extra virgin olive oil. Mix (with your hands, of course!) and taste. Need anything else? More of something? This is the fun part of cooking – you bring this dish alive and make it taste wonderful. Serve on its own, over arugula, or a mixed greens salad, ever so lightly dressed with lemon and olive oil. << Eggnog – 2 ways!